EDINBURG — The attorney for a man whose double capital murder conviction was overturned in 2014 on appeal urged jurors Wednesday to consider whether testimony they’ll hear will be the truth, or mere theory. Eloy Alcala, 51, is charged with the deaths of David Garcia and Victor de la Cruz, who were found in the early morning hours Oct. 8, 2010, with fatal gunshot wounds to their heads in the Pharr neighborhood of Las Milpas. A jury convicted him of two counts of capital murder in 2012, which Alcala appealed, winning a new trial in 2014. 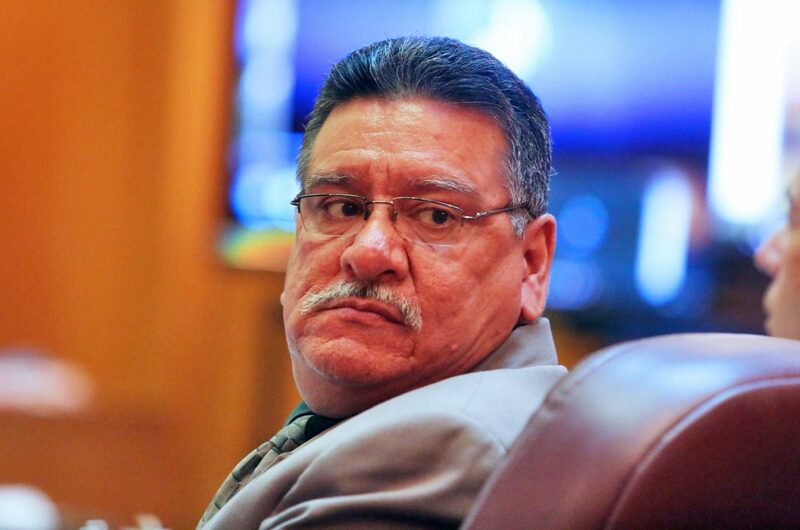 During opening statements Wednesday, the first day of trial, defense attorney Jaime Alemán told jurors that Alcala’s capital murder charges were the result of an incomplete investigation by Pharr police based on a “narrow” theory of the crime. “Are we looking at only a theory, and only the pieces that fit that theory, or are we letting pieces of evidence just drive by,” Alemán said, a reference to the description of the suspect vehicle that ultimately led officers to Alcala’s home. There were no eyewitnesses to the crime, and police initially received reports from neighbors of a gray or a white truck leaving the scene. Police headed to Alcala’s house — located less than four blocks from the victims’ bodies, where a white truck and a Cadillac with blood on the inside were found on his property — only after Garcia’s mother arrived at the scene and had told police her son had been involved in a physical altercation with Alcala’s son earlier that morning. The car is what Garcia’s mother said Eloy Jiovanni Perez Alcala had been driving at the time of the fight. Per the prosecution’s theory of the case, based on the police investigation, both Alcala and his son were responsible for Garcia and de la Cruz’s death. Jiovanni was convicted of capital murder in 2011 and is serving a life sentence, his appeal having been denied by the 13th Court of Appeals. Neighbors saw the elder Alcala drive his white Dodge Ram toward his house “blacked out,” with its headlights off immediately after they heard gunshots, Assistant District Attorney Monica Barron Auger told jurors. Although police never recovered a murder weapon, gunshot residue was found on the elder Alcala’s hands and clothing, and on the younger Alcala’s clothes, she added, further noting that Garcia’s blood was found on the truck’s doorstep and that of de la Cruz on the younger Alcala’s clothing. “Think about the sequence of events, think about what happened when because Victor was never there at the first fight …” Auger said. On Wednesday, jurors briefly heard from Pharr police investigator Enrique Ontiveros, the first officer to arrive to the crime scene, and he will return to the witness stand Thursday as the prosecution presents their theory of the case. In addition to police officers, the state is expected to call Garcia’s mother, at least one of the Alcalas’ neighbors and forensic experts who analyzed evidence to testify.